Hacking over 5 seconds off of her previous PB of 8:47.90, 18-year-old Leah Crisp powered her way to the wall first in an 800m freestyle gold medal effort of 8:42.61. The Leeds swimmer was even with European open water champion Danielle Huskisson and Loughborough’s Emily Clarke though just about the 700m, never more than a second ahead. But, Crisp turned it on the last 100m to take the title, improving up on her 6th place finish from last year. Huskisson produced a silver medal time of 8:45.57 tonight, well off her personal best and 17th fastest British performance of all-time of 8:35.99. Clarke touched in 8:45.77, a new personal best by over 2 seconds. The 2018 British champion Holly Hibbott, scratched this event. She took silver in the 200m last night. As a reminder, 2nd seed out of the prelims, James Wilby, opted out of the final after nailing a morning effort of 27.10, his personal best. That made him the 2nd fastest British performer of all-time and he’ll focus on the 200m breast later this week. The race was Adam Peaty‘s to lose, however, as the man already threw down a morning time of 26.51, tying what he threw down at the 2015 World Championships. Tonight he kicked off the blocks with a .63 reaction time, one of the fastest of his career, and roared to the wall in a mark of 26.49. That time ties with a previous performance of Peaty’s for the 9th fastest ever. For perspective, Peaty took 2nd at the 2018 Commonwealth Games in 26.62, gold at the European Championships in 26.09 and 2017 World Championships gold in 25.99 after hitting the 25.95 World Record in semi’s. He took the title last year in 27.11, while Wilby finished in 27.81 for the silver in 2018. Stirling’s Ross Murdoch hit a 27.45 for silver tonight, improving on his 5th place finish last year in 28.31, while his teammate and two-time Olympian Craig Benson collected bronze in 27.74. Murdoch holds a PB of 27.25, while Benson was 27.33 last year. Peaty remains on top of the world rankings. Isle of Man’s Charlotte Atkinson took the women’s 50m fly tonight in an extremely close race where the top 3 swimmers were separated by just .06 of a second. That time ties her own personal best, keeping her as the 14th fastest British performer ever in the event. Cardiff’s Harriet Jones was off her personal best of 26.63, but still produced a time of 26.85, good enough for silver. She took the title last year in 26.99, so at least a faster time was of some condolence for not defending her title. 17-year-old City of Derby swimmer Sophie Yendell raced a big-time 26.86 for bronze tonight, blowing her morning effort of 27.41 out of the water. Entering the meet the teen was seeded 4th in 27.09 and held a PB of 26.90 from the 2017 British Championships. However, Yendell broke through to dip under 26.90 in her podium worthy 26.86. She is within range now of Olympian Fran Halsall’s age group record of 26.74. Of note, Anna Hopkin, the University of Arkansas multiple All American led the women out of the heats in 26.69, a new personal best, but wasn’t able to match that tonight. The 23-year-old still performed under 27-seconds in 26.95 for 4th. Worldwide, however, the women sit well outside the top 25 times in the season’s rankings. 24-year-old James Guy retained his 200m fly national title from 2018 with another win this time around, clocking a gold medal mark of 1:56.51. The 2015 200 free World Champion led the field wire-to-wire, although Duncan Scott started creeping up on his Olympic relaymate in the last 25 meters. 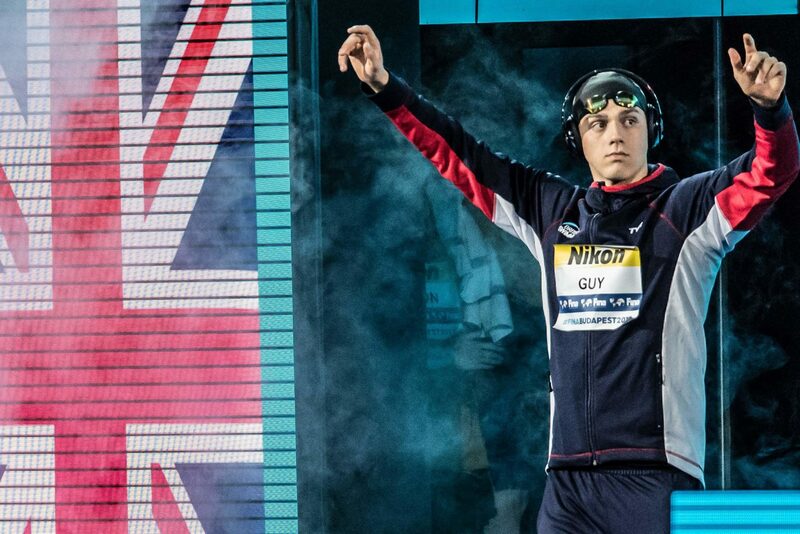 Guy’s personal best is the 1:55.91 he logged at the 2017 British Swimming Championships, a time which keeps him as the 3rd fastest British performer of all time. Tonight, however, post-race, Guy stated he felt like a ‘drowning hippo’ and has been focusing more on his freestyle training as of late. He’ll be taking on the 200m free shortly this meet. Scott wound up with the silver just about half a second back in 1:57.00, near his personal best of 1:56.60 from the 2018 Commonwealth Games where the versatile Stirling stud took bronze. 19-year-old Jacob Peters wasn’t able to replicate his 1:58.88 performance that led the men out of the heats, but the Poole swimmer still landed on the podium in a time of 1:59.14. Peters competed in this event at the 2018 European Championships where he logged 2:00.40 to finish 24th. He did wind up medaling at those championships in the form of the men’s 4x100m medley relay as a heats swimmer. Guy is now ranked 17th in the world, while Scott is 24th, but none of the finishers were near the 1:55.42 time needed to be considered for World Championships selection. There’s a chance one of them could add this event if automatically selected in another race. Firing of an opening split of 29.23, Energy Standard-trained Georgia Davies of Loughborough did her best to dip under the minute mark, but fell just short in a time of 1:00.31. The 29-year-old said after the race that she was ‘extremely disappointed’ with her time. She’s been as fast as 59.34 from this same meet 2 years ago, a time that keeps her as the 2nd fastest British performer ever in the event. Davies was hoping to be more in line in what she threw down for the silver medal here last summer, winning 59.36 at the 2018 European Championships. 23-year-old Bath athlete Jessica Fullalove led in 1:00.48 from the heats, but dipped down to silver in 1:00.84, while University of Stirling’s Kathleen Dawson rounded out the top 3 in 1:01.12. Dawson holds a PB of 59.58, but hasn’t been consistently back at that 2016 time. She was 1:00.84 en route to 4th last year, while Fullalove improved from her 1:01.05 for 5th in last year’s British Championships final. Already holding a personal best of 54.15 from this morning, 22-year-old Loughborough athlete Luke Greenank produced something special to take the gold tonight. He said post-race that his goal was to get under the 54-second threshold and the 2015 Euro Games multi-medalist was able to do it, splitting 26.42/27.50 to get the job done. In this 100m back event, Greenbank held a PB of 54.37 from the 2018 Commonwealth Games and he followed that up with 54.65 in Glasgow in the European Championships final. His winning time falls short of the 53.32 minimum time qualification, but may still be discretionarily picked. Helping his case is the fact that Greenbank’s outing this evening now makes him the 3rd fastest British performer ever, only sitting behind national record holder Liam Tancock (52.73) and Christopher Walker-Hebborn (52.88). Greenbank was 55.42 for runner-up behind CWH at last year’s British Championships. He’s now 17th in the world this season and renders good news for the British men’s 4x100m medley relay prospects. Loughborough teammate Joe Litchfield was next in line tonight in a mark of 54.71, while Newcastle 19-year-old Nicholas Pyle earned bronze in 54.82. Pyle holds a PB of 54.50 from the European Championships last year, while Litchfield’s time tonight is a lifetime best. Molly Renshaw took the gold in the final event of the night, logging the winning mark in 2:23.42. That dips under the selection #2 time of 2:23.95, which, based on the results here thus far, should be enough to get her on the Gwangju train. Runner-up was Stockport Metro’s Katie Matts in 2:25.58, while the reigning national record holder Jocelyn Ulyett held fast for 3rd in 2:25.79. Matts’ lifetime best is 2:25.06 from last year’s British Summer Championships. Renshaw has been on a tear in this event as of late, snagging Commonwealth Games silver in 2:23.28 and European Championships bronze in 2:23.43. She is now ranked #5 in the world this season. Would love to see Luke Greenbank nail a 53 low 100 backstroke. Optimistic. I’d take 53.99 – This group of British lads just need to keep notching it down a few tenths at a time and hopefully we’ll have a 53.5 leg to keep us close enough by Tokyo. Women’s 800 was always going to be a pedestrian time with Hibbott & Holden out, but that was a really good race. Can’t knock a 6s PB to win your maiden national title as a teenager. Beautiful stroke on Clarke fron luff.